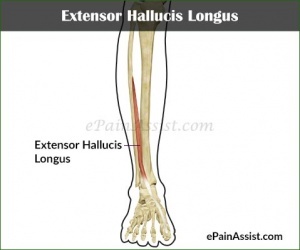 The EHL is a thin muscle, situated between the Tibialis anterior and the Extensor digitorum longus.It is located on the lateral side of the leg .It provides the only active extension force to the interphalangeal joint and the primary active extension force to the metatarsophalangeal joint.It has only a slightly smaller moment arm for dorsiflexion at the ankle than the anterior tibialis.It has a smaller physiological cross sectional area than either the anterior tibialis or the extensor digitorum longus . From the Middle two quarters of the anterior surface of fibula and the adjecent interosseous membrane . To the base of distal phalanx of the big toe . Deep peroneal L4 , L5 ,S1 . Extends the metatasophalangeal and interphalangeal joints of the big toe and assist in the in the inversion of the foot and dorsiflexion of the ankle . Branches of the anterior tibial artery. Extensor digitorum longus, Tibialis anterior, Peroneus tertius. Bends the big toe up. Bend the foot by the ankle up toward the front of the body. Assists to turn the sole of the foot inward, toward the other foot. Patient position : supine or sitting. 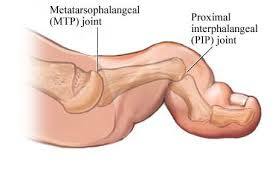 Test : extension of metatarsophalangeal and interphalangeal joints of the big toe. pressure : against dorsal surface of distal phalanges of the big toe in the direction of flexion. In the paralysis of EHL , the action of EHB is clear , the distal phalanx doesn't extend and the proximal phalanx extend in the direction of adduction. Weakness of EHL weaken extension at the metatarsophalangeal and interphalangeal joints .As it is the only muscle for the extension of interphalangeal joint so weakness of it is diagnostic for EHL weakness. During normal locomotion, an individual contacts the ground with the heel of the foot first. The ground reaction force applies a plantarflexion moment to the whole foot, which is resisted by all of the dorsiflexors. Weakness of the EHL diminishes an individual’s ability to control the descent of the medial portion of the foot, particularly the great toe. Patients with weakness of the extensor hallucis longus also report that the toe tends to fold under the foot when they are pulling on socks or shoes and can cause tripping. Tightness of the EHL pulls the metatarsophalangeal joint of the great toe into extension, which, as in the fingers and thumb, tends to produce flexion at the interphalangeal joint as the flexor hallucis longus is stretched, and a claw toe deformity emerges. Hyperextension of the great toe pulls the plantar plate distally, exposing the metatarsal head to excessive loads and producing pain. Similarly, hyperextension of the metatarsophalangeal joint pulls the interphalangeal joint into the toe box of a shoe, causing pain and calluses, or corns, on the dorsal surface of the interphalangeal joint. Claw toe deformities in a foot with sensation are quite painful. Claw deformities in a foot without sensation put the individual at risk of skin breakdown as the result of increased pressure under the metatarsal heads and between the dorsal surfaces of the toes and the shoe. It refers pain to the distal aspect of the 1st metatarsal and great toe, as well as the dorsum of the foot . It may reach up the leg as far as the point. These points are located just distal to the junction between the middle and distal thirds of the leg, just anterior to the ﬁbula. The patient may also complain of persistent dorsal foot pain. ↑ 3.0 3.1 3.2 3.3 3.4 3.5 Muscles: Testing and Function, with Posture and Pain. fckLRFlorence P,Elizabeth K, Patricia G,Mary M, William A.5th ed.2005. ↑ Steven E.Jurch. clinical massage therapy: assessment and treatment of orthopedic conditions,2007.